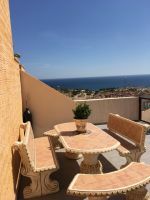 Description: This 2 bed, 2 bath apartment on the Mojon Hils complex has been finished to a very high standard, offering luxury accommodation combined with stunning sea views from an elevated position. There are stairs up to the apartment, with entrance via a small gate to the side. The accommodation comprises: front door with security grill opening into the living and dining area. 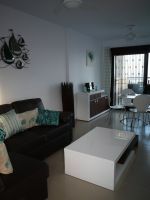 The spacious living area has a Tv, sofa and dining table with chairs. Patio doors open out onto the large terrace with glass balcony, sea views and a motorised awning to offer shade, which can be retracted with a remote control. There is airconditioning in all rooms, and the apartment also has a Wifi connection. The terrace has views over the bay of Mazarrón and the elevated position is one of the finest on the resort. Plenty of patio furniture makes this an ideal spot to relax and while away the hours in the sun, or take a siesta in the shade of the awning. There is a secure garage and the apartment has it´s own parking spot. Mojon Hills resort is just a 10 minute walk from the nearest beach down the hill, and there are bars , restaurants and local amenities such as shops and a supermarket in the village. The younger members of the family will adore the sandy beaches of Isla Plana, which are closest to the complex . The marina at Puerto de Mazarron is a short drive away, and here you will also find a large selection of shops, bars and restaurants. Whilst a car is not essential, we recommend car hire to fully enjoy the area. The Mojon Hills complex is ideally placed to visit Cartagena, Mazarrón and the Sierra Espuñas inland. Whatever the season, there is something close by to enjoy! Pets are not permitted in this apartment and smoking allowed on terrace only. This listing has been viewed 4375 times.